With the activities in Task 50, we aimed at improving the lighting refurbishment process in non-residential buildings in order to unleash energy saving potentials while at the same time improving lighting quality. 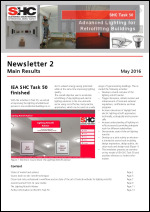 This newsletter presents an overview on key results of IEA SHC Task 50 and provides reference to further information. Lighting accounts for approx. 19% (~3000 TWh) of the global electricity consumption. 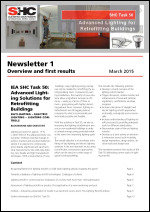 Without essential changes in policies, markets and practical implementations it is expected to continuously grow despite significant and rapid technical improvements, like solid-state lighting, new façade and light management techniques. With a small volume of new buildings, major lighting energy savings can only be realized by retrofitting the existing building stock. Compared to existing installations, the majority of new solutions allow a significant increase in efficiency – easily by a factor of three or more – going along with highly interesting payback times. However, lighting refurbishments are still lagging behind compared to what is economically and technically possible and feasible.